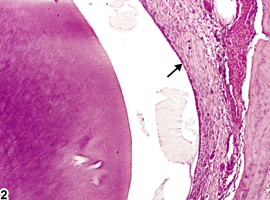 Normal ameloblasts (arrow) in a male B6C3F1 mouse from a chronic study. Tooth, Ameloblast - Atrophy in a male F344/N rat from a chronic study. The ameloblast layer is thin (compare with Figure 1), due to the decreased size of the ameloblasts (arrow). 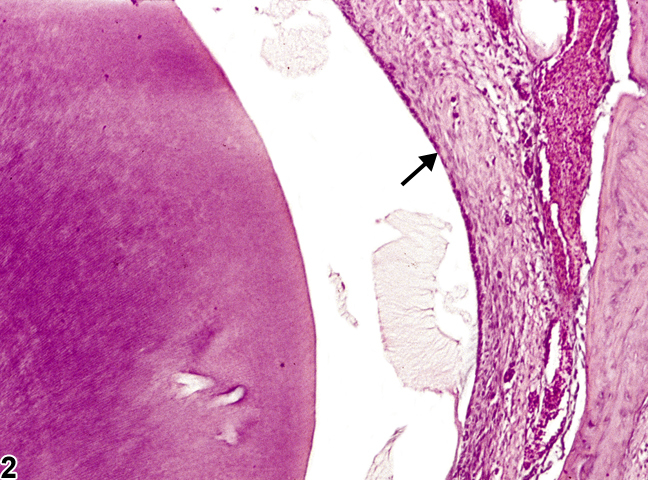 Normal ameloblasts (arrow) in a male B6C3F1 mouse from a chronic study (higher magnification of Figure 1). 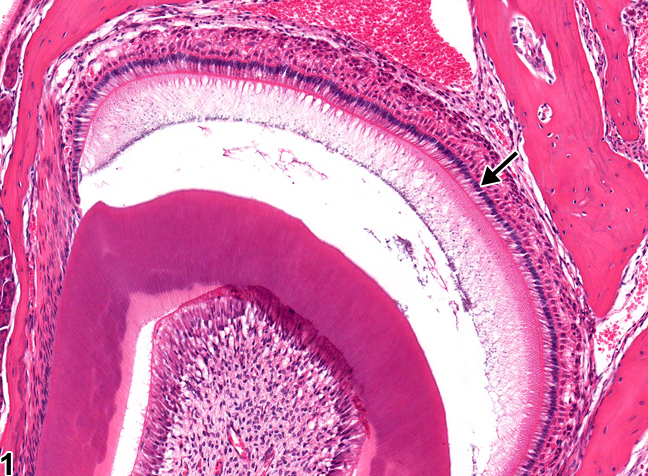 Tooth, Ameloblast - Atrophy in a male F344/N rat from a chronic study (higher magnification of Figure 2). The ameloblast layer is thin (compare with Figure 3), due to the decreased size of the ameloblasts (arrow). Ameloblasts ( Figure 1 and Figure 3 , arrows) are the cells responsible for enamel production. Focal atrophy of ameloblasts can lead to enamel hypoplasia, which is difficult to assess because enamel decalcification removes the enamel in tissue sections. The loss of enamel may impart a characteristic brownish discoloration on gross examination in affected teeth. Ameloblast atrophy ( Figure 2 and Figure 4 , arrows) can be caused by chemical exposure, most notably fluoride toxicity. 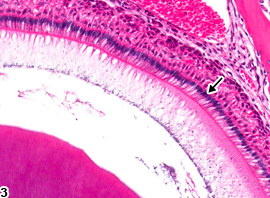 Odontoblasts can also be affected, but ameloblasts appear to be more sensitive. 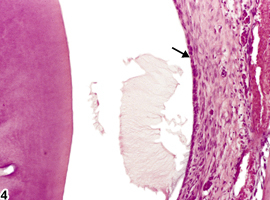 Atrophy is characterized by shortening of individual ameloblasts ( Figure 4 , arrow) due to decreased amounts of cytoplasm and smaller nuclei. 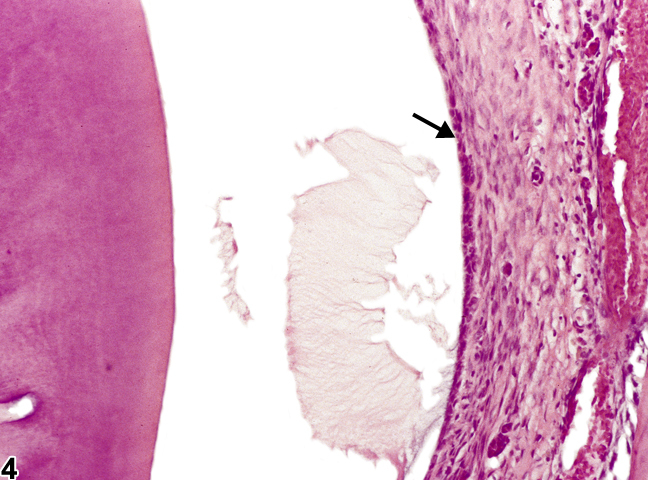 Atrophy can lead to squamous metaplasia of ameloblasts, characterized by loss of the columnar layer of ameloblasts with replacement by squamous epithelium (see Tooth, Ameloblast - Metaplasia, Squamous). Whenever present, ameloblast atrophy should be diagnosed and graded based on the degree of cellular atrophy and the number of ameloblasts affected. Fletcher AM, Bregman CL, Woicke J, Salcedo TW, Zidell RH, Janke HE, Fang H, Janusz WJ, Schlze GE, Mense MG. 2010. 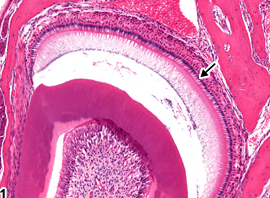 Incisor degeneration in rats induced by vascular endothelial growth factor/fibroblast growth factor receptor tyrosine kinase inhibition. Toxicol Pathol 38:267-279. National Toxicology Program. 1996. NTP TR-393. Toxicology and Carcinogenesis Studies of Sodium Fluoride (CAS No. 7681-49-4) in F344/N Rats and B6C3F1 Mice (Drinking Water Studies). NTP, Research Triangle Park, NC.